Imagine a pastry case filled with almond and lemon custard, topped with meringue. That’s what these delicious tarts are. They were made famous by the first celebrity chef Antonin Carême, who, cooked for the royalty of Europe in the early nineteenth century. He even cooked an incredible feast for Brighton and Hove’s own Prince Regent at the Brighton Pavilion. Carême didn’t stay long in the Prince Regent’s kitchen. It was said he found him vulgar and left Brighton to seek out better employers! 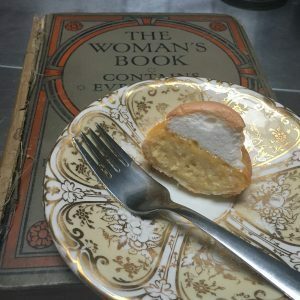 The name of these tarts could come from a small lace fichu worn as a head covering by women in the traditional costumes of some areas of France. Or it could be a cute form of the name Francoise. It may well be both! These tarts were a real surprise for me. They are similar to lemon meringue pie, of course. I’ve tried a simple almond flavoured one but there are also fanchonettes flavoured with pistachio, coffee, vanilla and apricot jam. The lucky volunteers and staff at the Town House will soon be very tired of eating fanchonettes as my plan is to create all of those flavours next week. Preheat the oven to 220c, 200 degrees fan, gas 7. Make the pastry by adding the butter pieces to the flour, baking powder, sugar and salt in a bowl. Lightly with your finger tips rub the butter into the flour mix until it starts to resemble bread crumbs. Add the egg with a fork and start to bring the mixture into a ball, finish this with your fingers, gently rolling the mixture against the side of the bowl. Wrap the pastry in cling film and leave to chill in the fridge for 20 minutes. Take the pastry from the fridge. Sprinkle your worktop with flour and roll out the pastry until thin. Using a pastry cutter, cut out discs that will fit your tart tin. I used a 12 hole tin but feel free to make larger tarts if you will. Fill each tart with a small piece of baking paper and beans, rice or ceramic beans. Put into your pre-warmed oven and bake them for 9 minutes. Take them out the oven, remove the paper and beans, and put back for another 5 minutes. Take them out the oven. Leave to rest. For the custard add butter, flour, sugar, ground almonds, lemon zest, egg yolks, egg and milk into a small pan. Put the pan onto the heat and very gently, on a low heat, whisk until the mixture thickens. This does take a while, keep watching and whisking. The mixture will need to become quite thick. Don’t stop too soon. This custard can be poured into the pastry cases and then they are returned to the oven. They will set in about 15-20 minutes. Now you can make the meringue. Put the egg whites, sugar, salt and lemon juice into a bowl and whisk slowly to start. Gradually increase the speed of the whisking. The meringue needs to be light and fluffy. You should be able to make stiff peaks in it. Spoon the meringue into a piping bag with a small hole. Remove the tarts from the oven when they are ready. Pipe meringue over the custard, if you are in the mood pretty ‘pearls’ look amazing, otherwise simply cover the custard, right to the edges. The tarts can now be returned to the oven for about 10 minutes, I like to leave the tops ever so slightly brown but this is really up to you. The tarts can be eaten hot or cold but I prefer them cold. I am busy planning a course in Regency Fancies for later this year (2018) and it seems almost certain that I will include Fanchonettes. 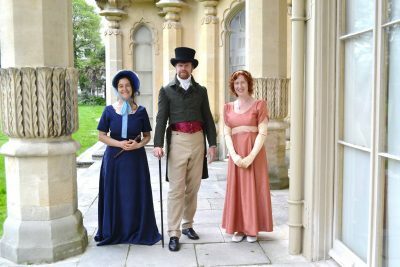 They will also appear on the menu for the Regency Dancing Event which will take place on April 28th, 2018. A booking link is here. If you would like to join me on a course please drop me an email or comment below. The Regency characters who will guide you through Regency Dancing steps on the 28th April at the Regency Town House. Oooo! Regency Fancies! I’m In! Of course I am twelve thumbs when it comes to twiddly stuff, but I can whip cream and wash dishes with the best of ’em! Oh! AND a friend asked me about the story that Carême invented the chef’s toque. Without tipping my hand as to what I told her, do you have a comment/opinion? Hey Mary-Denise wonderful to hear from you. I was just thinking through the Regency Fancies course and working out variations for those who were really experienced in decoration and those that weren’t. The Fanchonettes are a perfect example. The meringue can be piped, and topped with individual meringue ‘pearls’ or just thrown on, flattened down and sprinkled with almonds and icing sugar. Both variants are, luckily, equally wonderful to eat! That last bit about Carême will make a wonderful blog post as I have a fantastic book about him. I’ve just read this “The modern toque is popularly believed to have originated with the French chefs Marie-Antoine Carême (1784–1833), who stiffened the casque à meche with cardboard.” If you see the pictures of me on the website you can see I’m wearing a floppy version. There is a wonderful illustration of how he changed the chef’s outfit. The fantastic volunteers at the Town House have promised to create me an outfit like the master would have worn for when I’m doing Dine Like a Servant. I might have to work up to wearing a toque like him though! I really must try and find a date for this course. It looks like it might be great fun! Thank you for the recipe, I am going to attempt to make them for my Mother’s birthday party in July.